Quickand easy~ I created this meal in about 15 minutes~seriously!! You will love the Green Chili Polenta with Cilantro. It is one of the easiest meals you will ever create. First, you purchase the Green Chili Polenta with Cilantro and your favorite healthy spaghetti sauce. You will find Polenta with both the spaghetti sauces and in the Mexican food section. I found the Green Chili Polenta with the Mexican foods at Whole Foods. Water, Organic Yellow Corn Meal, Mild Green Chilies, Salt, Organic Cilantro, Organic Cumin, Tartaric Acid, Ascorbic Acid (Vitamin C), Beta Carotene (Vitamin A). First, slice the Polenta into 1/2 inch rings and warm in a pan (do not use oil-it will ruin the Polenta and cause it to fall apart) Cook on both sides. Second, while you are warming your Polenta, make your Cucumber Slaw. 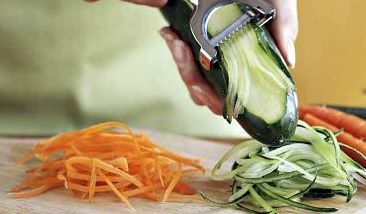 Use a Julienne peeler like the one below from Williams-Sonoma to quickly create long thin slices of both 1 cucumber and 2 carrots. Add in 5 sliced green olives if desired. Put 1 tablespoon of your favorite healthy Italian type dressing on it. Third, slice apple. Fourth, divide Polenta on two plates. Cover with red sauce and garnish with cilantro, basil or parsley leaves. Place Cucumber Slaw on plate with sliced apples. 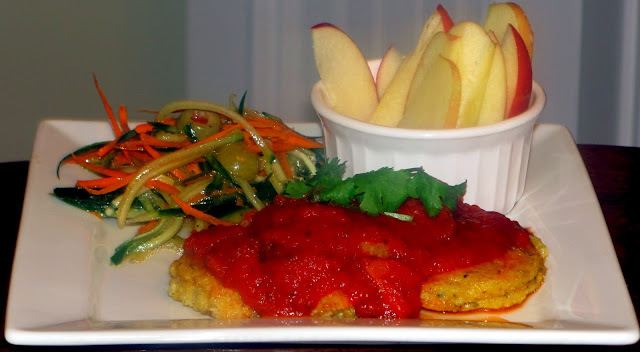 ENJOY this healthy and easy meal!! 1. Slice the Polenta into 1/2 inch rings and warm in a pan (do not use oil-it will ruin the polenta and cause it to fall apart) Cook on both sides. Warm red sauce. 2. Make Cucumber Slaw by slicing cucumber and carrots into long thin strips with Julienne slicer and add sliced green olives. Add Italian dressing as desired. 4. Serve Polenta on plate with red sauce and top with green garnish. Add Cucumber Slaw & sliced apple. Wonderful dish, healthy and gluten-free! Thanks for sharing! Looks like a fantastically easy weeknight meal! I think this looks delicious, I am going to make my polenta and sauce homemade, but what a great idea! Thank you! Thank you ladies for your comments~you are all awesome:) One of my future posts will be to make homemade Polenta. Though it can be bought ready-made with minimal ingredients,like the one I used, purists are correct in saying that "what one makes at home is better". I love all your remarks and checking out your blogs as well. Wow, what a beautiful and colorful supper! I just bought the same polenta...not that flavor, but by the same company, but wasn't sure how to go about cooking it. Thanks for the recipe and showing how it's done. Mom, this is such a great dish! And the thing I love most about it is that is is quick and easy and healthy which is how I cook MOST of the time! I am totally making this this week. I love the photos for this dish also. AND you look so unbelievably gorgeous in your new side pic! I have SUCH a beautiful Mother! That look yummy and delicious, how long time for make it. Excellent idea! Looks totally gourmet! Plan on about 15 minutes to prepare this meal. It is so fast and easy! Hey Mom! Dave got on your blo0g all by himself today and made me this recipe for dinner and it was SO GOOD!!!! We loved it and the kids ate it up!!!! Debbie this is beautiful -- I'm going to make it. Thanks! perfect meal. could eat everyday. I am making this for dinner tonight! I will have to let you know how it goes. I want something yummy, that doesn't take a lot of time and I think that this is the recipe!